Home » High iron–is this you?? Having low iron is all too common for hypothyroid patients due to their low stomach acid situation, or less common, having h-pylori bacteria or gluten damage. But high iron occasionally shows up on one’s lab results! How do I know when it’s high?? For women, we’ve noted frequently that if the serum iron is several points and more higher than 110, that’s a clue. For men, it appears that if it’s several points and more above the 140’s, that’s a clue. More clues explained below. It causes your body to absorb far too much iron, even just from your diet! Medically, it’s also called “HFE-associated Hereditary Hemochromatosis”. The clue you could have this is two-fold: a) knowing that your ancestors have had it is one clue. But some may not know. So the other clue is if ALL THREE of the following are high: serum iron, % saturation and ferritin. And the TIBC, an indirect measure of the iron-carrying protein transferrin, will be lower in the range when all three of the former are too high. To know for sure, you can do it yourself via 23andme.com The latter will tell you your genetics all over the place, not just this particular mutation! What do people with this expressed mutation do? They avoid high iron foods and Vitamin C (Vit. C increases the absorption of iron) as well as give blood, aka a phlebotomy. If you have hemochromatosis, your doctor will guide you on the latter–work with him or her! Some might give blood every few months; some might be able to go longer. If your ferritin is not high while the other two are, you may be #2 below, which is far more common. It’s been noted before that the MTHFR mutation was the most common reason for having high iron in some thyroid patients. MTHFR stands for the mouthful “methylenetetrahydrofolate reductase”, representing the MTHFR enzyme. When working correctly, this enzyme works with the folate vitamins (B9, folic acid), breaking it down from 5,10-methylenetetrahydrofolate to 5-methyltetrahydrofolate, which in turn helps with breaking down certain metals like iron. Thus, if your MTHFR gene has a mutation and that mutation is now expressing itself, your labs can look like this: higher than optimal serum iron and % saturation, a low ferritin….and a higher in the range TIBC. It’s the latter that especially gives away the problem, as with true high iron, the TIBC should be lower in the range, not higher. 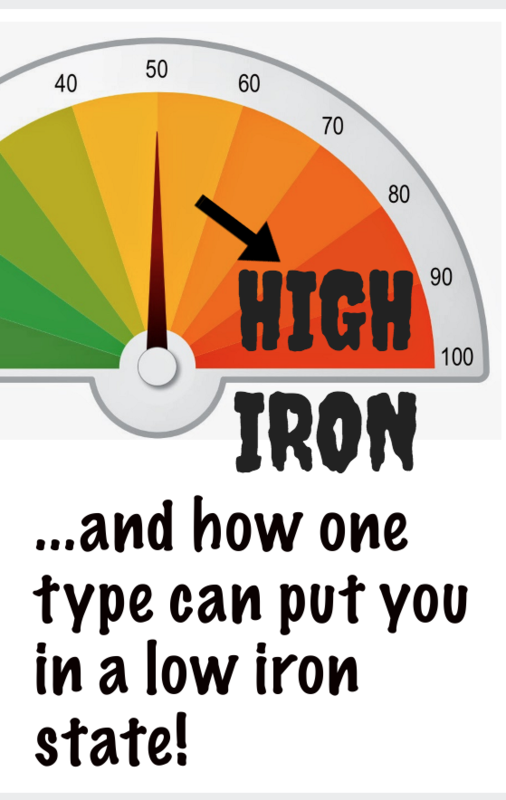 But here’s the kicker–if your iron is high due to the MTHFR mutation, you are in a low iron state! Why? Your body is unable to break it down for use! P.S. There are other methylation genes that could be causing additional problems. They include, but are not limited to, CBS, MAO A, COMT, MTRR, MTR, APOE, NAT 1 and 2, etc, etc. Dysmetabolic Iron Overload Syndrome (DIOS): This term has been used in a few places, including a study written by the European Association for the Study of the Liver.6 The study states it’s “detected in about one third of patients with nonalcoholic fatty liver disease (NAFLD) and the metabolic syndrome.” i.e. insulin resistance may also play a role in this for some. Hemolytic anemia: Simply put, this condition means one’s red blood cells expire faster than your bone marrow can replace them! Literature shows different causes, ranging from toxins, genetics, certain infections, etc. At first, states Wiki, your body can make RBC’s faster to compensate for the abnormally fast loss of RBC’s, but anemic symptoms eventually set in.3 It’s the compensation that may at first make iron levels look high. One’s skin may look yellow with this condition and urine may darken.3 This is definitely something you should work with your doctor about if you suspect it. Sideroblastic anemia: This inherited or acquired disorder (or sometimes of unknown origin) is where one’s body has available iron, but it’s not being unified with hemoglobin.4 The latter carries oxygen in the blood. As a result, one’s iron can go high, and/or the liver can be negatively affected or enlarged. It’s said to be observed more in males than females. Testing for this is done via “staining of the red blood cells”– they are looking for what are called ringed sideroblasts”.5 Also work with your doctor if you suspect this. Please don’t let all the above more rare conditions confuse you totally. We seriously see high iron mostly with the MTHFR mutation than the others. So at least explore that thoroughly. If you suspect any of the others, though, including the other methylation gene mutations, work with your doctor.